I’ve been planning to make myself a new bag for weeks now and finally did it! Of course, I made myself a bag recently, using a new design I had sketched out over Christmas, but I still wanted something dark to work with my typical winter attire. I have been saving some black chenille and a few weeks ago found a bird and leaf print which I loved. 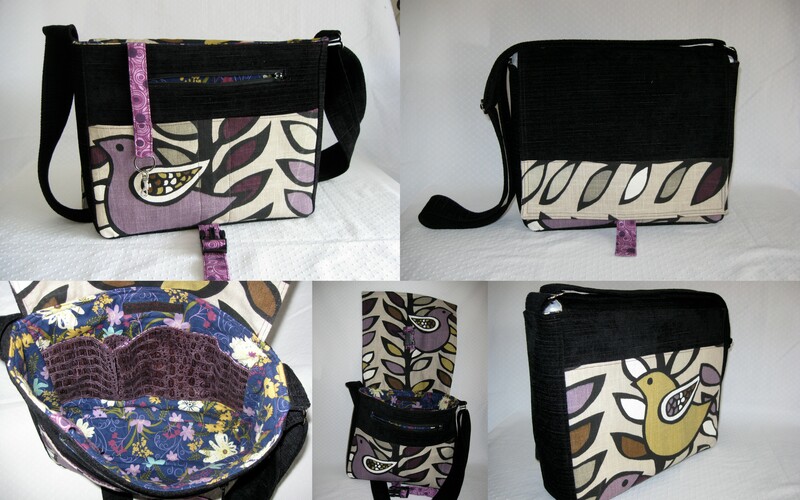 I decided on a messenger bag, as it is a very functional and streamlined style. For the interior, I used a blue floral print which worked well with the colours in the second print I found. I also used some coordinating fabric for the pockets, key clip and closure tabs. This entry was posted in handbag, sewing and tagged "messenger bag". Bookmark the permalink. 2 Responses to Mine, all mine! What fantastic fabric!! Love the bag, Fi! Thank you very much! I am thoroughly enjoying using it! Of course, that doesn’t mean that I don’t need to make myself more bags…. Laura Nelkin KAL on Ravelry – with prizes!